LeDaya Epps, a PVJOBS participant working on the Cren­shaw/LAX Transportation Project, was seated in the box with First Lady Michelle Obama, Dr. Jill Biden and Valerie Jarrett, senior advisor to the Present, at the State of the Union address on Tuesday January 20. Epps received PVJOBS’ Participant of the Year honors last fall for her life transformation and has overcome significant barriers in her journey to Washington D.C.
She worked in a hair salon and as a caregiver for a short time before becoming homeless. Epps admits that this was a time when money was scarce and she had to make food last in her household. After two years of unemployment, she went to a job fair and met a representative of the L.A. Black Worker Center, She joined and was referred to PVJOBS, which had secured a laborers “Boot Camp” with Walsh/Shea Corridor constructors and the laborers union local 300. 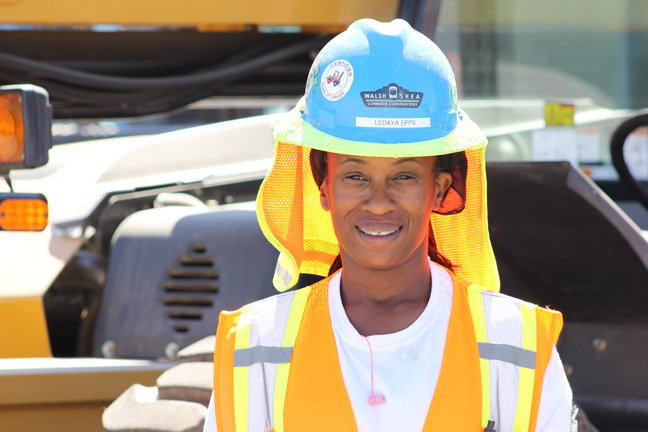 Not only was she the only female selected to graduate the Boot Camp, she finished at the top of her class and was also sponsored by Walsh/Shea Corridor Constructors in June as an apprentice laborer. As a single mother of three, she is grateful for the stability her career offers and the example it sets for her children.